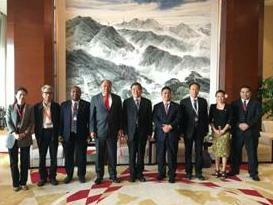 The visit began with a meeting with Mr. Zhang Hongsheng, Chairman of the Pacific Society of China, and Deputy Administrator of the State Oceanic Administration and his colleagues. Mr. Zhang delivered a brief introduction on the work of the State Oceanic Administration which is an administrative agency subordinate to the Ministry of Land and Resources. The Department is responsible for the supervision and management of sea area and coastal environmental protection, protecting national maritime rights and organizing scientific and technical research of China’s territorial waters. Further, the department also engages in activities for strengthening of marine conservation. 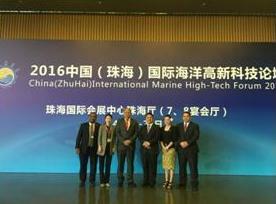 The Chinese Government are prioritizing cooperation with its partners through the below schemes with the hope of further developing the field of marine science and technology. The above scholarships are funded by the State Oceanic Administration and the Ministry of Education. There are 4 designated Universities that offer these awards which include China Ocean University, Xiamen University, Tongji University and Zhejiang University. Interested candidates are required to apply directly on the University websites and priority will be given to countries which have existing bilateral cooperation with China which includes Samoa. (Photo: (1) The Pacific delegation led by the Ambassador of Tonga, H.E Tau’aika ‘Uta’atu, together with Mr. Zhang and his colleagues. (2) From the left, Mr. Brian Kamu (PNG), Ms. Jane of the Pacific Society of China, H.E Tau’aika ‘Uta’atu, Ambassador of Tonga, H.E. Mr. Carl Apis Ambassador of Micronesia, Ms. Dorothy Ah Ching Meredith (Samoa) and Mr. Vincent Sivas (FSM).